I think I've been quietly missing the Garretts for the last three years. I remember picking up My Life Next Door based on its comparisons to Anna and the French Kiss and being pleasantly surprised at how thoughtful an exploration it was of families and first loves. And while I swooned over Jase and Sam right along with every other reader with a pulse, it was those forbidden Garrets that kept me thoroughly enthralled. Which is why my anticipation grew daily from the moment I heard about The Boy Most Likely To right up until release day. And then, perversely, when it finally came I worried. What if the balance is off? What if Tim isn't redeemable? What if (as was a touch true in the first book) Alice-and-Tim weren't the equals I wanted them to be? The thousand niggling questions of an anxious, but resolute reader such as myself . . . But, happily, the pull of returning to the cozy kitchen of the Garretts didn't allow me to hold out for long. And it was a warm welcome back indeed. Tim Mason doesn't expect anyone to believe him. He knows that ship sailed years ago when he started drinking, got his very own dealer, and required oblivion in order to get by. Now he's clean, sober, and being kicked out of his father's house at last. Already kicked out of high school, he takes his best friend Jase up on his offer of a place to stay, packs a single box, and moves into the dilapidated apartment over the Garrett's garage. But when Jase's older sister Alice discovers her little brother has up and allowed his deadbeat friend to move into the apartment she wanted, that trouble Tim can never seem to escape begins brewing once more. It doesn't help that he's had a crush on Alice forever and that her dolt of a jock boyfriend keeps giving him the evil eye anytime he comes within a five mile radius of Alice. Of course, Alice can take care of herself. She's been keeping herself as well as her entire motley family afloat since the car accident that put her dad in the hospital, thank you very much. And she has no time for a boy who's proven time and again that he wants nothing more from life than a good time. I love Alice, and you know why? Because she gives approximately zero damns about Tim from the word go. She has her priorities set, she knows what she wants, and she works so freaking hard to take care of the people in her care. Never mind that she never asked for seven siblings with another on the way and that she may have to defer nursing school again if those hospital bills keep coming. I love Tim, too, and you know why? Because he's serious about changing his life in his way. He may have no earthly idea how, but his eyes are clear despite being clouded for years. He sees Alice, recognizes what she is, and he never messes around with her. Despite their tacitly acknowledged attraction. Living in such close proximity to one another does lead to something of a softening of enemy lines, especially as Tim is incapable of turning the flirting off when it comes to Alice, even as he knows she's too good for him on pretty much every level. But just when things are maybe sort of starting to look up, his past comes back to haunt him in the most serious of ways. I carry both mugs from the kitchen, set his down in front of him. “Look. Stay. I mean . . . I can wait. It’s only fair. Jase didn’t know I wanted it anyway. Four months is nothing. You can be here for four months and then . . . “ I trail off. Like a home’s something you have to earn when you’re seventeen. He’s a kid. Not a man, not on some deadline. But with his jaw set and raised—I know that face. The I’m going to push on through, no problem, I’ll deal. Moving right along. Nothing to see here face. Know it as well as my own. It is my own. And I picture the rest of the lines on that paper. 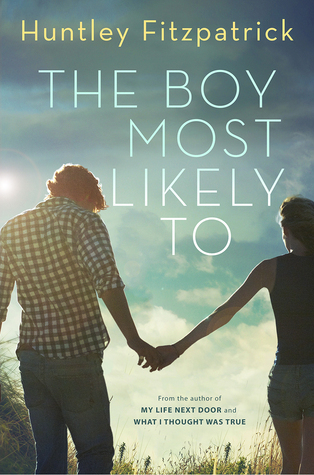 Tim Mason: The Boy Most Likely To . . .
“I want you here,” I add, my cheeks flaring. He shifts on the couch and I’m hyper-aware of him next to me, the smell of soap and shampoo, the heat of him, the alive of him. My words fall into the silence, and something changes. Tim’s shoulders straighten. He stills, but not frozen, more like . . . more like . . . alert. “Yeah? Then . . . I’ll be here,” he says quietly. The narrative alternates back and forth between Tim and Alice's perspectives, a touch that I appreciated and one that definitely aids in the reader having enough time with them to not only love, but get, these two individuals. No one has an easy time of it, and I wasn't sure at times things were going to work out in a way that felt both realistic and well (not a requirement, but frequently a hope). But it was such an enjoyable journey, and it has a last line that sticks with you the way I always want them to. Even now—a couple of days later—I'm murmuring it to myself as my lips curve in a satisfied smile. Book Binge - "I definitely recommend this book to fans of the contemporary YA romance but also of the first book in this series." Book Rock Betty - "YOU. MUST. OWN. THIS. BOOK." Christina Reads YA - "The Garretts, as always, are the charming backdrop, providing much needed humor and stability for the characters and us readers." Good Books and Good Wine - "Fitzpatrick is a master of creating family dynamics that are both exasperating and exhilarating in contrast." Love is Not a Triangle - "Even more than a romance, this book is all about Tim, and his growth is amazing to watch."